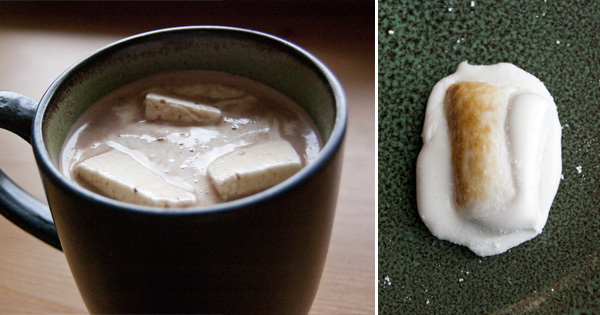 The title is a little dramatic, but seriously, if you haven't made your own marshmallows yet, do it! These won't be like your neighborhood Jet Puff variety. Shaped like a cube, soft with a bit of chew, you can feel the love that went into them. The real kicker, though, is your ability to infuse them with any flavor you want! These white delights are coconut vanilla, but can you imagine almond or peppermint or rum? Can't you just taste it now? Then simply cut them into strips, then cubes, dusting as you go, 'cause these guys are sticky. 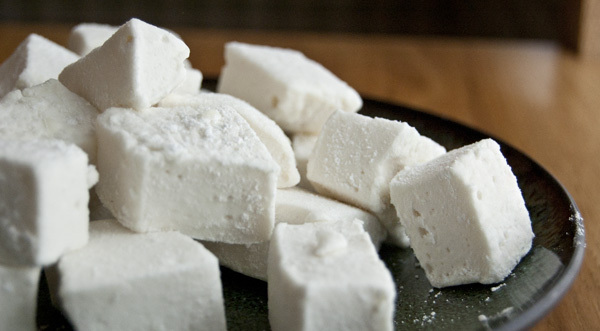 It was Kendra who first inspired me to make my own marshmallows. She posted the recipe along with a tantalizing description on her blog, My First Kitchen. Thankfully, despite the blog being gone now (the domain is for sale, btw), she uses Google Docs to keep her recipes public, so I could still fulfill this item on my bucket list! 1. In a large mixing bowl, combine the gelatin and 1/2 cup of cold water. Set aside. 2. In a small saucepan, stir together 1/2 cup cold water, sugar, corn syrup, and salt. Put the lid on, turn the heat to medium-high, and allow it to bubble for four minutes. 3. Take off the lid, place a candy thermometer on the side of the pan, and cook another 7-8 minutes until the mixture reaches 240 degrees F.
4. Using a whisk attachment, whisk the sugar mixture into the gelatin mixture on low speed. Add the sugar mixture slowly. 5. Once it's combined, add the vanilla. Turn the mixer to high, and beat 15 minutes until the mixture is white, shiny, and gooey. 6. Combine the powdered sugar and cornstarch in a small bowl. Line a 13x9 pan with soil, and lightly spray it with cooking spray. Sprinkle some of the cornstarch mixture into the bottom of the pan and along the sides. 7. Pour the whisked mixture into the pan. Top with more of the cornstarch mixture. Allow it to sit uncovered for several hours or overnight. 8. Turn the marshmallow square on to a board sprinkled with the cornstarch mixture. 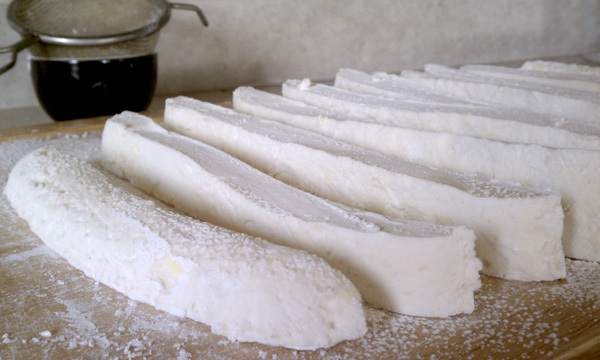 Cut the marshmallows into the desired size, coating all sides with the cornstarch mixture. Yum, those look sooo delicious! I think I need to make them soon! I found that it's actually good to leave them uncovered too, otherwise they get all moist and soak up the powdered sugar on the outside and stick to each other. But, that might have just been my recipe too! So far they've been doing alright. This recipe uses a 1/2 cornstarch + 1/2 powdered sugar mixture to coat them, so cornstarch might be the key.